The PIXCI® CL2 frame grabber supports Full, Medium, and Base configuration Camera Link cameras. Compatible with the 64-bit/ 66MHz PCI bus, the CL2 board interfaces to many of the newest, most advanced, highest bandwidth machine vision cameras available. Up to 400 megabytes per second data transfer to the host computer. Camera specific control – exposure, bit depth, gain, frame rate. Camera operation in free-run mode – supporting maximum frame rate sequence capture. Camera operation in control (trigger) mode. The PIXCI CL2 is a plug-n-play frame grabber board requiring no hardware setup or adjustment. Install the board, load the software, connect to the camera, and begin to capture images. When the XCAP imaging program is started, it automatically reads a camera identification code programmed on the PIXCI CL2 board. This code specifies the camera being used and allows XCAP to immediately load the appropriate video format and display the camera’s dedicated Capture & Adjust Dialog (camera control menu). The XCAP imaging program supports up to 8 PIXCI CL2 boards(on the same or multiple buses) making it possible to use multiple Full, Medium, or Base configuration Camera Link cameras simultaneously. The XCAP-STD program allows simultaneous use of the PIXCI CL2 with other EPIX frame grabbers supporting different camera models, either camera link compatible or not, allowing one computer to support simultaneous use of different cameras under the control of one imaging program. Medium and Full Configuration Camera Link cameras usually require more PCI bus bandwidth than provided by a 32-bit/33MHz PCI bus. 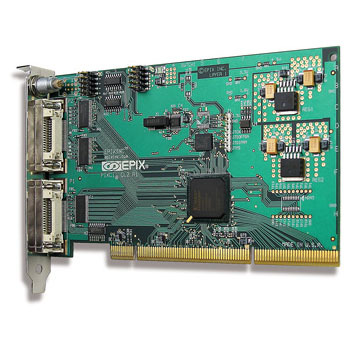 The PIXCI CL2 frame grabber requires a 64-bit/66MHz PCI bus slot, or a PCI-X bus slot. These buses are available on server or workstation computers, which EPIX can assemble to your custom specifications. EPIX, Inc. has been providing imaging solutions and support for OEM machine vision manufacturers and engineers since 1984. Contact EPIX, or your authorized EPIX distributor, for help selecting cameras, frame grabbers, imaging software, optics, lighting, and computer systems.